ARLINGTON, Texas – Jordan Hansen tossed his riding bag a few feet in front of him outside the Team Canada locker room at AT&T Stadium Sunday to a loud thud. Hansen then hobbled his way over to his teammates for a group picture with their friends and family following the conclusion of the WinStar World Casino & Resort Global Cup USA, presented by Monster Energy. The 25-year-old had aggravated a prior right MCL injury when Legit turned back, hooked him and sent him soaring following a 3.49-second buckoff in the Bonus Round during the final day of competition at the Global Cup. 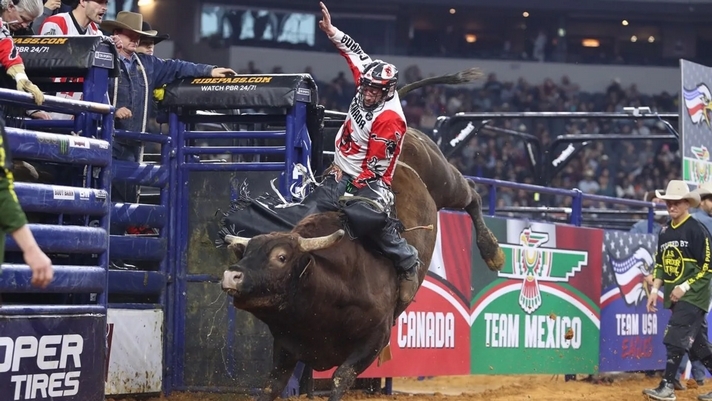 Legit was marked only 44.75 points, but he continued to establish his reputation as one of the meaner bulls in the PBR. Hansen first injured the knee in Fort Worth, Texas, at the PRCA event being held during the Fort Worth Stock Show & Rodeo. Hansen was the lone bright spot for Team Canada as the Canadians finished the third Global Cup in last place. The Okotoks, Alberta, bull rider capped the Bonus Round Saturday night with 87 points on Bottoms Up and then began Sunday afternoon’s performance with a solid 85 points on Check It Out. Hansen (2-for-4) accounted for two of Canada’s three rides in Arlington. Dakota Buttar was the only other Maple Leaf rider to reach 8 seconds when he converted on Accelerator for 86 points on Sunday. “I let a couple slip by me that I shouldn’t have, especially that first day (with Jaywalker),” Hansen said. “I feel like I should’ve rode that bull all day. Even today. (Legit) is an awesome bull, but that’s still one I feel like I can ride. Hansen is ranked 71st in the PBR world standings and is going to be competing at PBR events and rodeos throughout 2019. He is supposed to be competing at the San Antonio Stock Show & Rodeo for three days beginning on Tuesday, but he is not sure if he will be healthy enough to give it a go. © 2019 PBR Inc. All rights reserved. Wrangler Network with Bloomer Trailers.